Christopher Bange returns with his new solo clown show that’s sure to please! 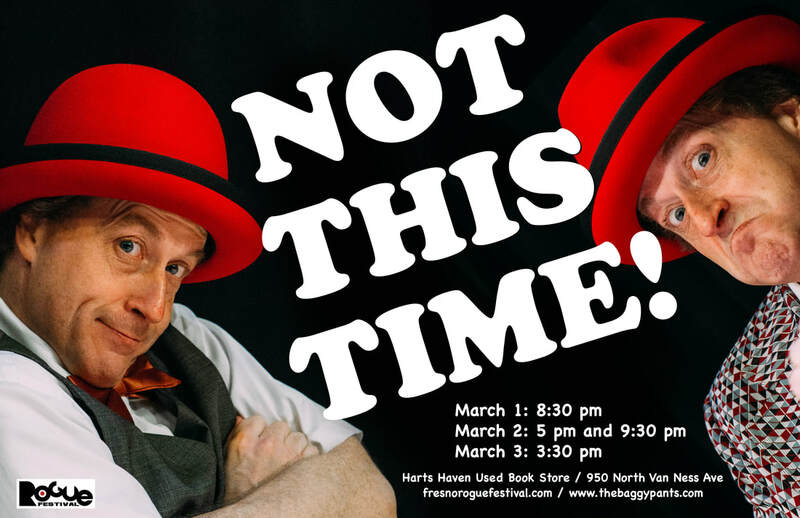 Chock-full of silliness, mime, hat tricks, magic, time travel, and birds of prey? If you had a chance to correct the greatest mistake of your life, would you? Christopher Bange is a baggy-pants clown in the Bill Irwin mold, blending mime, juggling, playwriting, props, and benign insanity into an audience-interactive whole. Not This Time! stitches vignettes that seem to have no connection into a time-travel romance that touches the heart. Sometimes, he’s a naïve young man dealing with love and grief. Sometimes he’s a crotchety old man. Sometimes he’s both at the same time, performing against himself, like those movies where one actor plays multiple parts in the same scene, thanks to special effects. Here, the special effects are generated in the viewer’s mind. Gradually, what he really is becomes clearer, but it is all expressed without words......It’s funny, it’s strange, and it made me cry. Bange’s theatrical kaleidoscope can be in-your-face and abrasive, even without words. He’s demanding, insistent, and will take you on his personal journey, will-you, nill-you, but you ought to go. It’s worth the trip.